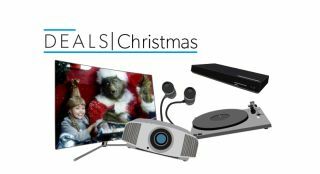 Best Christmas deals 2017 – Amazon Echo, LG OLED, Samsung QLED | What Hi-Fi? With Christmas closer than we’d all like to admit, it isn’t too late to hit the shops (or sites) – especially as there are some cracking hi-fi and home cinema deals to be had. You can give the gift of music to the whole family this Christmas for the price of a sandwich. Until Christmas Eve Eve (otherwise known as the 23rd December), Amazon is offering new subscribers to its Amazon Music Unlimited music streaming service, three months of the 'Family Plan' membership for £3. The plan delivers all the benefits of the £8 per month individual membership, but for up to six people. Those wanting in should visit Amazon and enter the promo code 'FAMILY3'. One of our top Black Friday deals, this Award-winning 55in LG OLED is still at the killer price of £1489, down from our £3000 test price. It’s available from a number of retailers. Our favourite 4K Blu-ray player, the Sony UBP-X800 sets a new benchmark for the money, and has had a healthy slash from several retailers. Have you been good enough this year to justify treating yourself to a multi-thousand-pound music streamer? Linn sure hopes so. Until 26th January 2018, the British brand is offering a complimentary Majik DSM streamer when you buy a Klimax DS 3 (£15,800) or Klimax DSM (£18,900), or a complimentary Sekrit DSM when you buy an Akurate DS (£5150) or Akurate DSM (£6350). Samsung is running a 100-day trial offer on its flagship QLED TV range (until 28th February) and The Frame TV (until 15th January), so anyone making a purchase before those dates can return it for a full refund within 100 days. The included models range from the QE49Q7C to the QE55Q7F and Q9 range. £44.99 - Great savings for Christmas! In an act of shameless self-promotion, we can’t help but suggest our own printed form as a pressie for anyone who not only likes listening to music but also reading about the kit that's best to play it (and films) on. Our annual subscription gets you 13 issues (one per month, plus our annual Awards issue) featuring the world’s most trusted tech reviews (and some darn good features, if we say so ourselves) for less than £3.50 a copy. A puck-sized Alexa device designed to be connected to existing speakers, systems or even headphones. It has the same Alexa voice assistant and skills, and looks like the top of an Echo speaker - complete with control buttons and volume ring. Sonos and several retailers are extending their Black Friday deals on the Play:1 and Play:3 into the festival season, offering the five-star wireless speakers for £150 and £250 respectively - the lowest price we've seen them. Classical music connoisseur? We suggest you peruse the Primephonic download store as there is 20% off select albums this December. Sound quality may only be so-so, but the sequel is cheaper, smarter and better at listening than the original. The Echo Show – an Alexa speaker that features a video screen – is also on sale for £129.99 (down from £199.99). Maximising the inherent qualities of LCD/LED technology and combining them with Samsung’s world-renowned processing, this QLED telly is a real thrill to watch. If you have a telly that has compatible 2.0, HDCP 2.2-certified HDMI inputs for 4K passthrough but are missing such comprehensive app support, the Fire TV 4K could be exactly what you need. The non-4K, non-HDR Fire TV Stick with Alexa (2017) is also currently on offer for £29.99.